It was a visit to Glasgow in the autumn of 1856 that started it. The visitors were members of the Institution of Mechanical Engineers of Birmingham, under their President Joseph Whitworth, and they aroused interest among the Glasgow engineers who formed the welcoming committee. 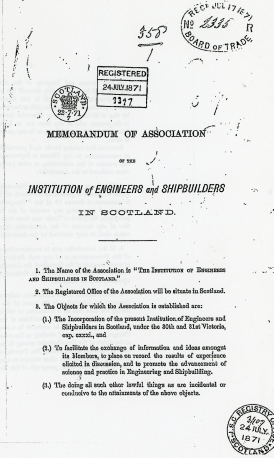 The interest developed to the point where the first General Meeting of the Institution of Engineers in Scotland was held on 1 May 1857. Office bearers were appointed and the principal objective of the new Institution was set down as "the encouragement and advancement of Engineering Science and Practice". It was to have a broad basis for membership, and engineers from the mining, foundries, railways, iron shipbuilding and other industries were to be eligible. The driving forces were the 36-year-old W J Macquorn Rankine, Regius Professor of Civil Engineering and Mechanics at Glasgow University, (pictured left) and Walter M Neilson, already on his way to being the principal manufacturer of railway locomotives in Great Britain. They were to become the first and second Presidents of the Institution. Support was quickly apparent. Despite the substantial subscription of three guineas on entry the membership increased steadily and at the end of the first session stood at one hundred and twenty-seven. In those early years there was a pervading atmosphere of enquiry into the applications of steam power. In 1858 the Institution was responsible for a public meeting, held in the Glasgow City Chambers, to establish "An Association for Promoting Safety, Economy and Absence of Smoke in the raising and use of Steam". The Scottish Shipbuilders Association was established in September 1860 to perfect, as far as possible, the art and science of shipbuilding. It also gave early proof of its value when one of the members read a paper on river steamers and put forward proposals for the fitting of deck saloons. The Association followed this with an approach to the Board of Trade - ­then the statutory authority - and got its agreement that deckhouses used as shelter would not be measured and added to the tonnage of the hull. From then onwards the misery of pleasure sailing on wet days was gone. In 1864 a union of these two technical bodies was proposed and, after a certain amount of manoeuvring, the first united meeting took place on 25 October 1865 under a cumbersome new name. The present title was finally adopted just before the Incorporation by Charter in 1871, when the then membership of about 400 were told by the President that it would become the third senior incorporate body, junior in age only to the Physicians and Surgeons and the Procurators. 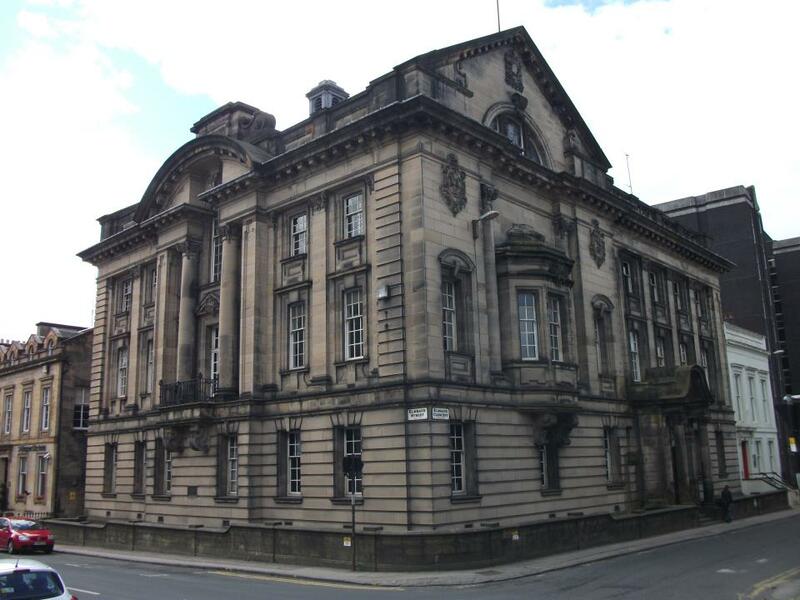 The Institution met originally in the Philosophical Society Hall in the Andersonian College building at 204, George Street in Glasgow. Increasing dissatisfaction with those premises - and with the fact that they lay too far to the east of the business centre - was eased at a meeting with the Lord Provost in 1867, when a Corporation scheme for converting part of a building at 2, Dalhousie Street was discussed. This was accepted later as the basis of a ten-year lease of one and a half floors. Ten years later the Institution was on the move again. The Philosophical Society, their friends from the Andersonian, joined in a mutual ownership proposal and the two combined to build new premises on a plot at 207, Bath Street. By the end of 1880 the new three-storey property was complete. It was the remarkable increase in membership, which was to bring the occupation of Bath Street to an end. Between starting there and leaving in 1908 numbers rose from about 500 to some 1600. 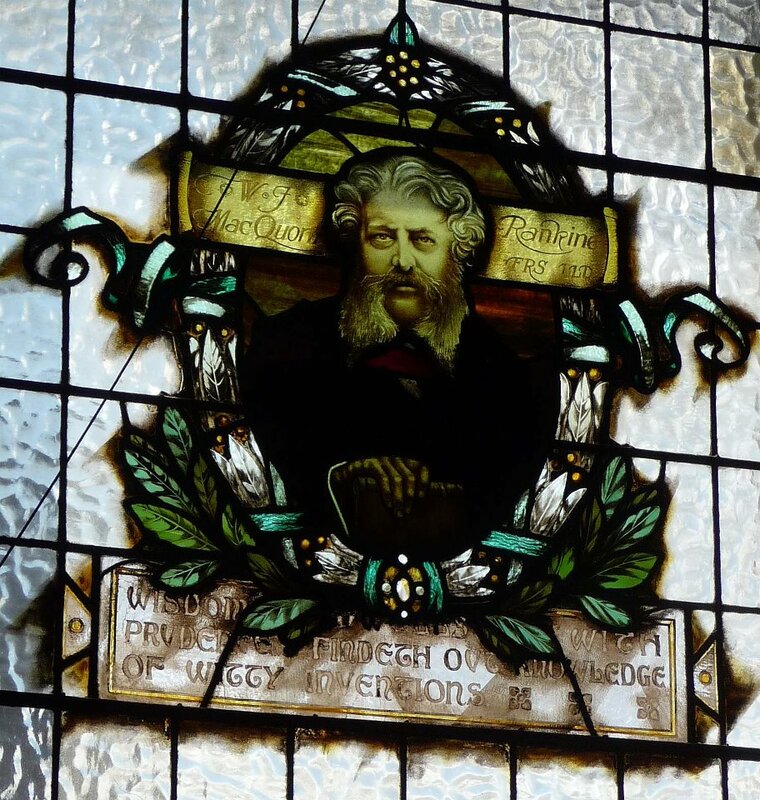 Agreement had been reached in 1905 that the Philosophical Society would buy out the Institution for £4000 and that the latter would become a tenant at Bath Street for up to two years. The new headquarters of the Engineers and Shipbuilders at 39, Elmbank Terrace were opened in December 1908 with more than 500 people present. A public appeal for funds, with the addition of its own resources, resulted in the Institution being out of pocket finally by only £281 on a total bill of about £30,000. The handsome new building contained a large library, the Rankine Hall with seating for 400, a smaller hall and various committee rooms. The premises were much in demand for use by other groups. 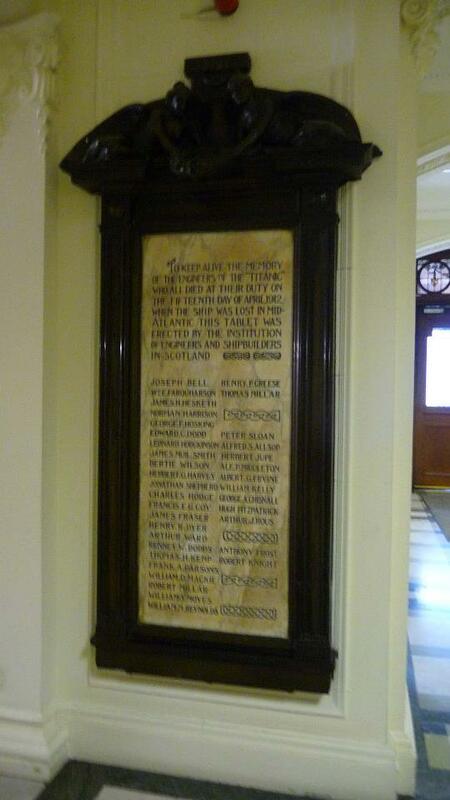 In the foyer, there is a memorial to the engineers who lost their lives on the Titanic. Taken over by the Ministry of Munitions during the First World War, and in part by the Shipbuilding Conference in the Second, the building was to serve the Institution until 1968 when size and maintenance costs made it no longer viable. It was sold to the Corporation of Glasgow and leased by it to Scottish Opera. 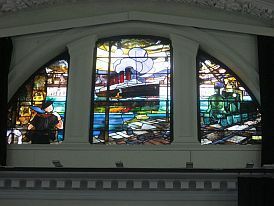 The premises remain today essentially as they were and complete with their fine stained glass windows, still owned by the Institution, as is the Titanic Memorial Plaque erected to keep alive the memory of the Engineers of the "Titanic" who died at their duty when the ship was lost in mid-Atlantic in April 1912. The Engineers and Shipbuilders then moved into premises at 183, Bath Street and named them Rankine House. Although the total membership remained at over 1000 Rankine House also became too expensive and, in the twenty-odd years since it left there in 1981, the Institution has occupied in turn much smaller premises at Charing Cross Tower, Atlantic Quay and now the Clydeport Building in Robertson Street, Glasgow. From its earliest years the Institution placed emphasis on having a good library and money was regularly allocated for the purchase of books, even at times when there was no proper place to keep them. 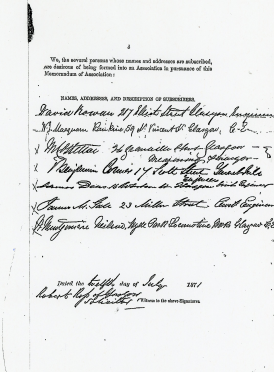 The first inter-library exchange of Transactions was in 1859, the result of a letter from the Association of Architects, Engineers and Surveyors in South Australia. By 1968 the Elmbank library was exchanging with nearly 100 others throughout the world. It had also been the recipient of a number of unusual gifts - the original builder's model of the steamer "Comet", the engine-builder's nameplate from the Great Eastern and a Rhone engine of 90 horsepower - the type fitted in Sopwith and Bristol aeroplanes in the First World War. Among the papers were a copy of the 1839 contract between Cunard and Napier, ordering the ships, which started the Cunard Line, and an autographed letter from James Watt. In the end the 10,000 books and other material in the Library were handed over to Glasgow University, which agreed to take the collection complete. The original Annual Dinner of the Institution of Engineers and Shipbuilders was held in March 1882. This was not the first of its kind, however, as the Foremen Engineers of Glasgow had been meeting since 1845 to celebrate the January birthday of James Watt (pictured left). In 1887 the Foremen agreed to hold their dinner in association with the Institution and the Philosophical Society and it was renamed "The James Watt Anniversary Dinner". The first joint event was held in the following year but, as the involvement of the others declined, the Institution took complete responsibility from 1895. From Victorian times there was a liberal attitude to the younger members. They were encouraged to have their own meetings, their own President and their own social calendar. From session 1890/91 a Register Book was kept in the Library as a link between prospective employers and graduates, of which there were then about 200. Relations with the Universities have been amicable. By 1870 moves were afoot to establish lectureships in Naval Architecture and Marine Engineering in memory of the pioneer shipbuilder John Wood, but the proposal was not welcomed unanimously and was dropped for ten years. About 1881 lectures were begun, and the widow of the shipbuilder John Elder - who had died in 1869 before he took up the Presidency of the Institution - endowed a Chair of Naval Architecture at Glasgow University in 1883. The Institution had agreed earlier to continue the lectures in parallel with the Chair. 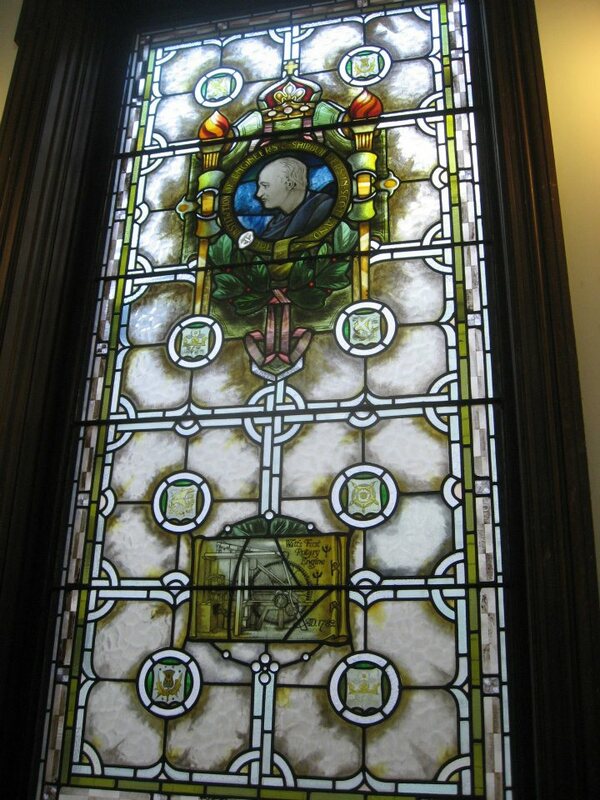 During the session 1920/1921 the Institution launched an appeal to mark the centenary of the death of James Watt. About £30,000 was raised and the two lectureships were converted into James Watt Professorships - one in Electrical Engineering and the other in Heat Engines, later to become the Chair of Mechanical Engineering at Gilmorehill. For more than 100 years the Institution has contributed to a wide range of activities through its representation on the technical committees of various bodies. They have included the former Glasgow and West of Scotland College, the Glasgow School of Art, British National Committee on Materials, British Standards, Board of Trade Consultative Committee and Lloyds Register of Shipping. In addition it has played its part in the industrial and scientific debates of the time. In the decade from 1867 the Institution worked with Glasgow University in the important business of compass correction and acted as liaison between the University and the Board of Trade. William Thomson (later Lord Kelvin - pictured left) presented a paper on compass adjusting, advocating the use of the Clyde estuary in place of the accepted Gareloch. In session 1872/1873 attention was drawn to safety valves and the subsequent recommendations produced considerable improvements in their design. Other years brought other matters, while the Forth and Tay railway bridges were subjects of continuing reports. Indeed the member Sir William Arrol presented an 'Album of the Tay Viaduct' to the Library. Further generosity to the Institution has included the setting up about 1950 of a fund to allow meetings to be held outwith Glasgow. The result was regular visits to Aberdeen and Greenock and more occasional meetings in Dundee. The introduction forty years ago of the annual MacMillan Lecture - named after a distinguished shipbuilder in Glasgow - and of the later biennial Marlow Lecture, endowed by the late Sir lain Stewart, provided opportunities to hear distinguished speakers. Premiums and medals may be awarded for papers read and these include the W W Marriner, which dates from 1942. From as long ago as 1858 there have been joint meetings with other groups. The Institution has benefited especially from its regular contacts with the Royal Institution of Naval Architects, the North-East Coast Institution of Engineers and Shipbuilders, the Institute of Marine Engineers and others. Major events originated by the Institution included the Glasgow International Congress in 1901. This comprised nine different sections of engineering, each with its own Chairman and its own papers, under the overall chairmanship of Lord Kelvin. The Institution's International Congress in 1938 coincided with the Empire Exhibition in Glasgow and the Congress attracted almost 1000 delegates from 22 countries with the first Viscount Weir in the chair. On the centenary of the Institution in 1957, there were more than 500 registrations, including visitors from Europe, Asia, the Americas and Australasia. The Centenary was marked in more lasting form by arranging for two of the ancient pews in Glasgow Cathedral to be renovated and for the Institution's coat of arms - which had been presented as a warrant by the retiring President in 1939 - to be carved on each. The Engineers and Shipbuilders in Scotland have been mindful of their responsibility to the past. In 1913 a memorial stone (left) was erected in the Southern Necropolis at the unmarked grave of John Robertson, builder of the engine put into "Comet" in 1812. 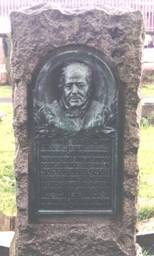 In session 1930/ 31 the tomb of Henry Bell in the churchyard at Rhu was repaired and in 1951 the memorial stone to the Institution's first President was restored in Sighthill Cemetery. Principal amongst them have been the Secretaries, thirteen in all in one hundred and forty years. Three of these account for a combined total of more than ninety years and extend successively from 1871 until 1967. Of these three, W J Millar came first. Originally recommended by Macquorn Rankine, he served for 25 years. His other activities included being a candidate for what had earlier been Rankine's Chair at the University and he also edited Rankine's papers. He was followed in 1896 by E H Parker, formerly an assistant to Froude at the Experimental Tank in England and appointed from Denny in Dumbarton. He retired in 1930. The third member of the long-serving group was P W Thomas, who took over from Parker and continued for thirty-seven years. A man well known in Glasgow, he continued his secretarial duties during the Second World War, as well as being Technical Assistant to the Director of Merchant Shipbuilding in London. Later, he was also Secretary to several committees of the Scottish Council (Development and Industry). More than 130 years ago the then President said of the Institution " ... We must be careful that it advances with the requirements of the age, and see that no obstacles are presented to its embracing students of all classes, and particularly those young men to whom the country looks forward to perpetuate its good name for mechanics and engineering". Of its type the Institution of Engineers and Shipbuilders has been the most broadly based in Scotland. Its past has been linked naturally to the Glasgow area but, as its future increasingly may lie elsewhere, it must provide an ever-widening forum for a broad range of engineers to listen to and be heard by others. In 2011, IESIS launched a new initiative, The Scottish Engineering Hall of Fame, to celebrate Scotland's proud tradition of engineering and shipbuilding, and to provide iconic role models for young people before they make career choices. The first seven inductees were announced by President Gordon Masterton at the James Watt Dinner in September 2011.